Whether you’ve just discovered your first forehead wrinkle or have to deal with them every morning when you look in the mirror, forehead wrinkles are in evitable part of life. Unfortunately though, not enough people know why they have them and what they can do to get rid of them. Doing a little extra research can make all the difference when seeking the perfect treatment to get rid of your undesired forehead wrinkles. How and Why Do Forehead Wrinkles Form? Facial aging is often most noticeable in the upper third of the face, around the eyes, and on the forehead, with forehead wrinkles (or rows) being one of the most prominent signs of aging. There are four major factors that contribute to forehead wrinkles. Aging: Not surprising, the most common cause of forehead wrinkles is aging. The natural effects of gravity combined with the loss of collagen causes the skin on your forehead to lose its natural elasticity over time. As this occurs, skin and underlying tissues sag resulting in undesirable wrinkles. Sunlight/UV Rays: Sun damage to skin varies depending on factors, such as level of exposure, skin type, and age. Whether it’s from spending time in tanning beds or overexposure to sunlight, the effects of harmful UV rays are cumulative and cause changes to your skin including premature aging, discoloration, and wrinkles. Genetics: A new study shows that genes from your mother’s side are more likely to affect the way your skin ages. Although genetics are not the sole determining factor, it’s a good bet that if your mom showed signs of early aging, so will you. Lifestyle: Poor diet, excess sun exposure, and too much alcohol all negatively affect our skin’s appearance, but the most damaging lifestyle choice is smoking. This is because the nicotine contained in cigarettes causes the blood vessels in the outermost layers of your skin to narrow resulting in less blood flow to your skin. Less blood flow means less oxygen and nutrients like Vitamin A which inevitably leads to faster developing wrinkles. There are two common issues that affect the forehead and both are key signs of aging. They are forehead rows and glabellar lines. 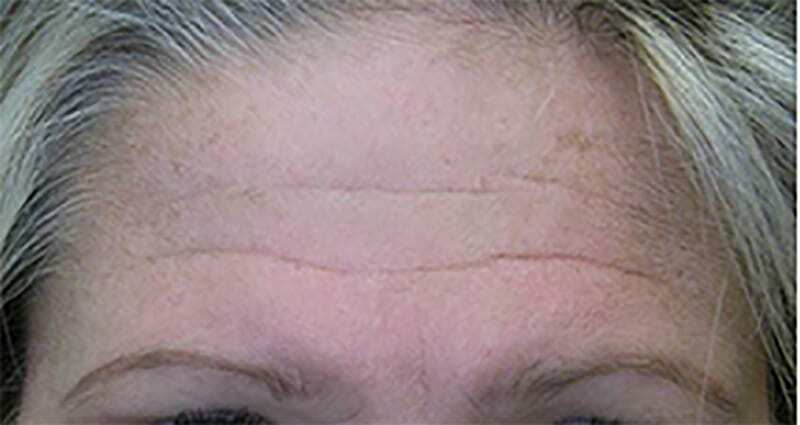 These are the deep, horizontal wrinkles that typically extend across the forehead in rows and are often more noticeable when you raise your eyebrows. Forehead rows typically start out as dynamic wrinkles that only show when you raise your eyebrows (typically at a younger age) but over time develop into deeper wrinkles that affect the underlying muscles of the forehead and display without any facial expression. When this happens, a cosmetic surgeon will develop a unique treatment program that is designed specifically for you. This plan will typically include periodic treatments of Botox, lasers, and fillers to remove your forehead rows all together. Also known as frown lines or “11’s”, glabellar lines are the two vertical lines that form between the eyebrows, just above the bridge of the nose. As its nickname suggests, glabellar lines are most commonly visible when frowning. Similar to forehead rows, the more pronounced and deeper the glabellar lines are, the more comprehensive your treatment may need to be. Today there are two primary types of procedures available to address forehead aging — surgical and non-invasive. Before the days of non-invasive procedures, surgical treatments were the only options available. 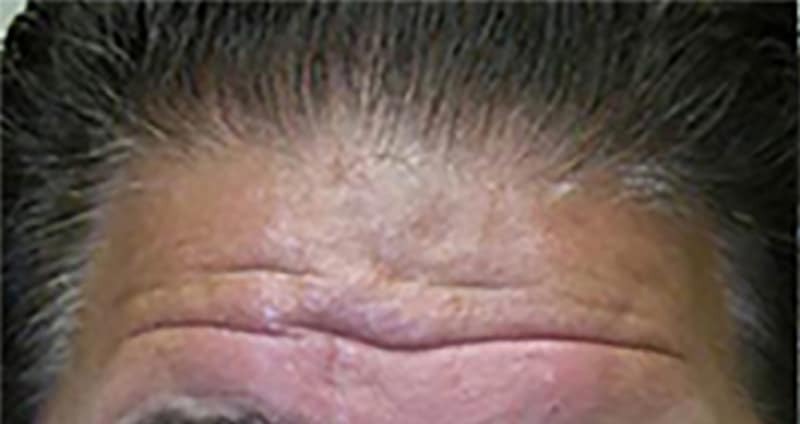 However, these surgical procedures were highly invasive, very expensive, and often caused undesirable scars that resulted from incisions made across an individual’s hairline or scalp during the procedure. Over the years, advancements in non-invasive treatments have nearly eradicated the need for surgical procedures and have allowed for forehead wrinkles to not only be removed in a safer matter, but in a much more efficient way as well. In today’s cosmetic world, intramuscular injections and injectable fillers are very prevalent and the recommended choice for treating forehead wrinkles. Products such as Botox and Dysport can have a significant effect on the appearance of your forehead by relaxing the underlying muscles while injectable fillers, such as Juvederm, can offer immediate results when applied to deep wrinkles. It’s important to note that everyone will be different in their recommended treatments, so this is where consulting with an expert injector is crucial and necessary. For dynamic wrinkles or those caused by direct muscle movement such as when you frown or raise your eyebrows, your best options are typically going to be Botox and/or Dysport injections. This is because these injectables work by relaxing the muscles of the face and prevent forehead wrinkles from showing when making muscle movements specific to the forehead. In many cases, Dysport will be the recommended injection due to its ability to spread more than Botox which is ideal for getting rid of wrinkles with as few injections as necessary. Both of these products are variants of botulinum toxin A, a neuromuscular blocker which is injected directly into underlying facial muscles where they prevent the release of acetylcholine, and prevent the muscles from contracting. This results in the smoothing of facial skin and reduction of forehead rows and glabellar lines. Over time, however, dynamic wrinkles will deepen and take on a more long term effect. When this happens, they will begin to show even when you aren’t making facial expressions. If this is the case for you, your best option may be to consider dermal fillers. When Botox injections aren’t enough, products such as Juvederm and Restylane have been developed to physically fill in deeper wrinkles that Botox and Dysport injections simply aren’t designed to do. These treatments are intended specifically to address volume loss in your skin that develops over an extended period of time and results in much deeper pronounced wrinkles that are visible when making little to no facial expression. Dermal fillers are also very commonly supplemented with Botox and laser treatments to assist and achieve an encompassing rejuvenated look. One advantage to dermal fillers is that not only do they reverse the signs of aging, but they do so almost immediately. You can literally leave the doctor’s office looking visibly younger than when you arrived! To help assist with keeping your forehead skin tight and smooth, laser resurfacing treatments are commonly supplemented with injectable procedures. Lasers work well with maintaining and ensuring wrinkles closer to the surface of the skin remain unseen after a Botox or related treatment. But it’s important to note that while lasers are very effective at treating dynamic wrinkles caused from facial expressions, they tend to prove slightly less effective on deeper wrinkles of the forehead. This is because the additional smoothness added to the skin from laser resurfacing does not address the underlying forehead muscles the same way Botox and dermal fillers do. This is why it’s always important to make sure you address your concerns with your cosmetic surgeon before making any decisions about which procedures you think may be right for you. Skin care products, such as ZO Skin Health, EltaMD, and Latisse are an essential age fighting tool. They can enhance the outcomes of in-office treatments, and potentially extend the longevity of results. Now that you have a better understanding of what happens to your skin as you age, what treatment options are available, and which ones might be right for you, it is important to consult a qualified cosmetic surgeon. Dr. Steven Fagien, MD, is one of the foremost oculoplastic surgeons in the the world. He has built his reputation on challenging traditional techniques and developing cutting-edge advances for a variety of procedures. Dr. Fagien has authored over 300 publications, penned his own bestselling textbook on Cosmetic Oculoplastic Surgery, and given over 1,000 presentations about his techniques to surgeons around the globe. If you’re considering taking the next step in your plan to maintain your youthful appearance, contact Dr. Fagien’s office today.